Depth: Surface sow. Firm into growing medium and cover lightly with vermiculite. Starting Indoors: Start in containers 6-8 weeks before last spring frost. Keep at about 65-70°F. Retain moisture by covering with plastic until germination occurs. Starting Outdoors: Recommended; direct sow in early spring as soon as the soil can be worked. Sow in early to mid summer in cooler areas for flowers until late fall. Set out two weeks before last frost date. 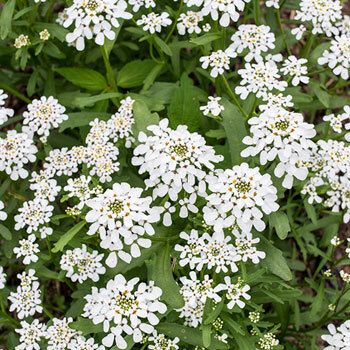 Rocket candytuft is an easy to grow border flower and is also perfect for the cutting garden or a child's flower bed. Also a good pick for rock garden settings. They resent heat and humidity, blooming all season in cooler summer areas, spring to summer elsewhere. Watering Details: Keep moist until seedlings are established, watering only during drier spells thereafter—1" per week is plenty. Soil pH: Not particular about pH but does best in neutral settings and will tolerate higher alkalinity. Fertilizer: In locations with poor soils, an all-purpose granular, organically-sourced fertilizer can be scratched into the soil. An all-purpose water-soluble fertilizer is another good option. Avoid high nitrogen fertilizers. Plant: Sturdy stems with lance-shaped leaves up to an inch long. Flowering: Hyacinth-like blooms all season are bright, icy white corymbs, covering the plant. Seeds: Flowers turn into seeds that are flat, papery, oval-shaped seed capsules, brown in color. Self-sows, but not to the extent that it becomes a nuisance. When to Cut: As soon as the majority of florets have opened on the flower head. The genus name Iberis is a Greek word, referring to the plant's origin, Iberia. The common name “Candytuft" stems from the existence of the flower on the island of Candia, now known as Crete.